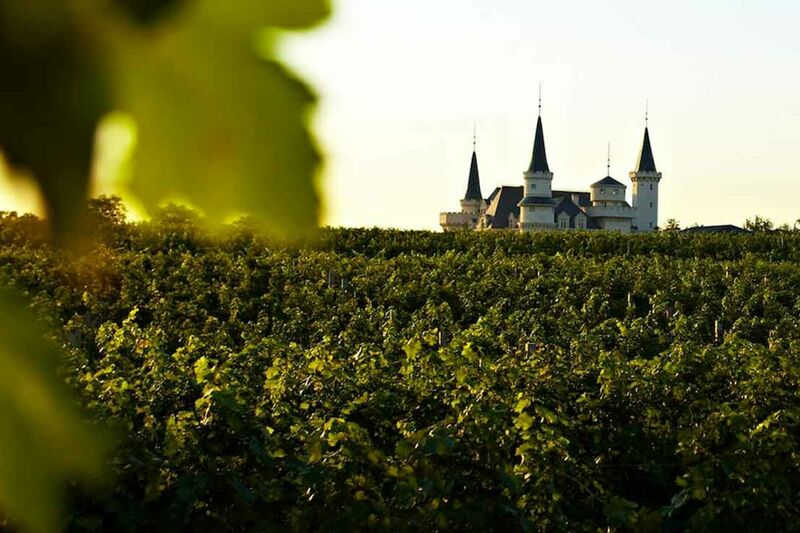 Changyu, China’s winemaking powerhouse, is building French-style chateaus and Italianate castles around the country—and an entire “Wine City”—to encourage the country’s passion for the grape. At Chateau Changyu Reina, honey-colored brick towers enclose wide cobbled courtyards, and vast, wood-beamed halls look as if they are prepared to host an imminent medieval banquet. At first glance, the Italianate castle and winery could have been built hundreds of years ago, in Italy’s Tuscan hills. The chateau is but one part of an ambitious 600 million yuan ($86.9 million) complex completed four years ago just outside the city of Xi’an, in Shaanxi province in central China. It is a prodigious winemaking operation powered by more than 2,000 acres of vines. Currently, it’s annually churning out 5,000 bottles, mostly merlot—and the goal is to drastically scale up. The cellars at Chateau Changyu Reina have room for as many as 150,000 oak barrels. The faux-historic halls of the castle are also home to an interactive exhibition that walks visitors through the history and making of wine. Mirrors encourage visitors to stick out their tongues to examine their taste buds; there’s a statue of Bacchus, plus a wall that showcases the various strata of soil, or terroir. Inexplicably, a giant, smiling face resembling a cartoon grape beams out from one corner. An oversized globe spotlights the world’s other wine regions, while a table covered in Perspex tubes and buttons asks users to see if they can match a region to a scent. There’s even a room dedicated to former Chinese leaders (none of whom seem to be enjoying a glass of wine). This mock castle isn’t unique. It’s one of a network of so-called chateaux built across the country, from Ningxia province to Beijing, by China’s oldest winemaker, Changyu. These grand castles, each inspired by a different European winemaking country, are a concrete sign of the company’s ambitious plans for Middle Kingdom wine. According to the International Organisation of Vine and Wine, China is the second-largest wine grower by vineyard area, behind only France, with land under vine roughly the size of Puerto Rico. The challenge Chinese winemakers face, though, isn’t quantity. It’s improving the quality of whatever juice those lands can produce, and that’s where Changyu has tapped an experienced, new partner for help. 77-year old Augusto Reina isn’t just the namesake of that Shaanxi chateau; he’s also the head of Illva Saronno Holding Spa, the Italian winemaker best-known worldwide as the producer of Disaronno liqueur. Reina has imported his know-how to help China’s nascent industry produce vintages that even the sniffiest wine snob might deign to sample. In return, Changyu named a castle after him and even crafted a life-size bronze of the Italian sitting on a bench in the vineyard—raising a glass. Sitting in a hotel near that castle (and sculpture), Reina anticipates what you’re thinking. “When we came to China seven or eight years ago, I had a stomach ache, I must confess it, from the quality of the wine. It was not so good,” he explains, via a translator. Yet the entrepreneur saw potential in both the product and the market; by 2013, China had become the world’s biggest consumer of red wine and has continued to grow. For more than two and a half years, Reina negotiated with Changyu. “They were very demanding, challenging negotiations. I don’t think this kind of thing would be possible for an American or a French company, because they have such a different business culture,” he continues, diplomatically. Eventually, Reina brokered a deal that included Illva taking a significant equity stake in Changyu. The pact also initiated an in-depth cultural exchange, sending Illva’s winemakers to various Changyu sites to help school their new colleagues, as well as bringing Chinese staffers to Italy on a tasting tour. The Italians helped Changyu select the grapes to grow and offered advice on how to tend to its existing vines. They pitched in with expertise in selecting machinery for production, too, such as bottling lines. One conundrum that even the Italians can’t crack, though, is the dominance of red wine. Redolent of such renowned regions as Burgundy and Bordeaux, red wine shares a color with both the Communist Party and good luck. Unfortunately for lovers of Chardonnay or Sauvignon Blanc, white is the color of mourning and is mostly worn at funerals, which stigmatizes blanc plonk long before it’s opened. Nowhere is that partnership more evident than at a second Changyu site, in the resort city of Yantai on China’s northeastern coast, just across the Yellow Sea from North Korea. This is the location of the company’s most aggressive and surreal project so far: Wine City. Set on more than 1,000 acres and costing an estimated 6 billion yuan ($870 million), it is aptly named, a sprawling hybrid of production facility, tourist attraction, and trippy fantasia. The inevitable rows and rows of vines pale next to the manmade structures that dot the landscape. There’s already one chateau, a white neo-Gothic structure that looks like the set of Monty Python and the Holy Grail, and two others are nearing completion. Another Gothic-inspired pile, complete with an artificial moat, will be dedicated to championing and producing red wine, while the squat and sturdy Romanesque chateau next door—imagine the home of any Disney princess—is a temple to brandy making, a first for the company. A swirling skyscraper is under construction on a nearby hill, too: Six abstracted champagne flutes decorate the façade of this Wine Research Institute. (Bordeaux’s new Cité du Vin seems a flimsy rival in comparison.) It will house scientists working on perfecting those vintages, as well as tasting rooms and bars offering views of the countryside, at least on days when pollution from Beijing doesn’t descend in a thick, white smog. Such fumes don’t have much immediate effect on vines, compared with toxins in water or soil, so China’s notoriously noxious air have not yet impacted its wine output. The glass clinks noisily as it trundles around 10 snaking automatic bottling lines, and the cleaning system automatically sterilizes 120 cold stabilization tanks, which help forestall the broken glass-like crystals that form in chilled, bottled wine if it’s not properly handled. While the Changyu brand is emblazoned on almost everything, occasionally other names peek through—Italy’s Tecninox and ERsistemi, for example, collaborated on that cold stabilization room; almost every piece of major tech in the plant is Italian-designed, thanks to Reina’s investment and influence. “All the technologies here are exactly like the ones we have, but since our plant was built two years before them, this is even more modern,” he says, proudly. Can Changyu’s deep-pocketed attempts under Reina’s tutelage really create a new winemaking hotspot? “It’s definitely one of the recognizable big brands, along with Great Wall and Dynasty. Thus, it has instant brand recognition for many Chinese consumers, “explains Edward Ragg, of (Dragon Phoenix Wine Consulting) in Beijing by email. He is cautious about the Italians’ impact on what goes into the bottle. Euromonitor International Ltd. analyst Spiros Malandrakis is more bullish, drawing parallels with the surging British sparkling wine industry, which has been buoyed by climate change and a few canny blind tastings in which it beat Champagne. “Considering the amount of money being in, and the people involved, we will soon be seeing not just award-winning sparkling wine from England, but I wouldn’t be surprised to see super-premium red wines from China, too,” he tells Bloomberg.